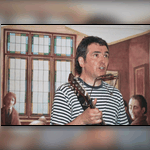 Jez Lowe is a well respected song-writer whose songs are loved and sung throughout the folk world and to start our 54th year we have the man as well as the songs. Come and be mesmerised by the skill and ease that he conveys stories of the ordinary people and trades of his beloved north-east a rich heritage that needs to be cherished. Jez is a long-time favourite of the club so please get here early.